It’s a well known fact that we are nation of gamblers with the gaming industry attracting the most cash and visitor traffic on the internet. At V Factor creative services we can design and print scratch cards for your business and they are a proven winner to increase interaction with your clients. They are also great for up-selling your clients or increasing their loyalty to your brand by adding discounts or 2 for 1 deals underneath the latex panels. 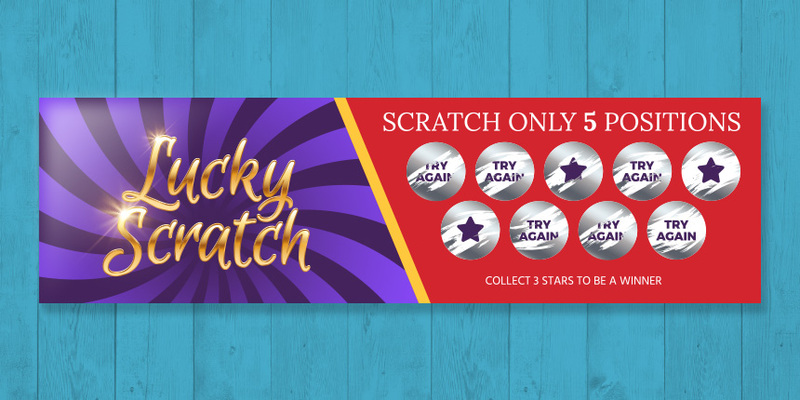 Our creative team can work with you to design and develop a scratch card game for your business to provide a tangible marketing campaign that will increase awareness of brand products or services. Also once you have approved your design we take care of all the scratch card printing. If you would like more information on our Scratch card design service or Scratch card printing services please contact V Factor Creative Services. We are a design agency based in Warrington, Cheshire delivering innovative design concepts that generate results.